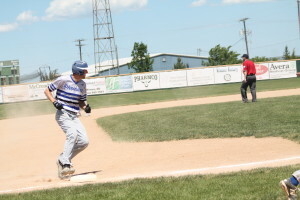 Winner/Colome amateur baseball team won two games in the Sunshine League tournament in Parkston. The Pheasants defeated Dimock/Emery 16-1 in 6 innings on Sunday. The Pheasants advanced to the District 5B championship. Derek Graesser didn’t allow a hit in the game. Zach Harter had a three run home run to highlight the scoring. Graesser and Dillon Lambley each had two doubles while Lakin Neugebauer had three hits and Reed Harter added a two hits. The Pheasants had eight runs in the sixth inning to end the game early. Winner/Colome will face Alexandria at 7:30 p.m. Friday for the district title. Winner/Colome picked up an 11-1 victory over Platte in the first round of the district tournament on Thursday in Parkston. The Pheasants Jared Donahue was the winning pitcher. He pitched all eight innings, struck out 15 batters and gave up three hits. Offensively, Austin Richey had a three run home run, drove in four runs and added a single. Austin Calhoon, Derek Graesser and Geno Katz all had two singles. Calhoon had an RBI and Katz dove in two runs. Winner/Colome collected 11 hits.